Fifty years ago this Christmas, Jimmy Greaves was in his pomp. In a golden era for the English game, Greaves was the ace poacher, a master in the art of putting the ball in the back of the net. The Spurs marksman was expected to finish as the First Division's top scorer for the third season on the trot. His mission was complicated by the exploits of an unassuming individual from Bray who had no interest in the stardom that came with his profession. Just two Irish strikers have ever finished a top flight season at the head of the charts. John Aldridge hit 26 for Liverpool en route to title joy in 1987/88, a fine tally. 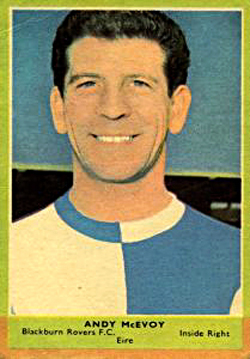 However, it was McEvoy who blazed a trail in 1964/65, the first Match of the Day season. The Blackburn star registered 29 goals, matching Greaves' return, so they shared the honour. What makes it even more outstanding is that Rovers only finished 10th. "George Best is a young lad with a very bright future," wrote columnist Eddie Boyle, "But despite his wonderful football ability I don't think he has, as yet, reached world class. McEvoy undoubtedly has." He struck 32 goals in 37 games, his best ever tally, but three less than Greaves. Household names Roger Hunt and Denis Law were behind him. "I just happen to be in the right place at the right time," he told the Irish Press. In Con Martin's Soccer Annual, he outlined his simple secret to success. "Don't shoot for the sake of shooting. Try and pick your spot in the goal and the further away from the goalkeeper the better." Precision was his calling card. McEvoy was revered by team-mates who respected a player who was two-footed, well-balanced and had no trace of an ego. McEvoy was embarrassed by adulation. "He never sold himself at all," said Hale. When he came back to represent Ireland, his routine centred around catching up with his folks in Bray - his dad, Lally, was an accomplished footballer - and then dropping into the Gresham for a few pints and scrambled eggs on toast, often carrying his boots in a plastic bag. That never quite happened. Hale reckons that established members of the dressing room could not quite relate to McEvoy's belief that football was not the be-all-and-end-all. "They felt it was a lost opportunity," he muses. He excelled for Limerick, winning an FAI Cup medal in 1971 even though work meant that he rarely trained. Boss Ewan Fenton couldn't leave him out, stressing that "he was so good, he should never have left English football." McEvoy was satisfied. "He was always happiest after games sitting around having a beer and a chat with his mates," recalls Hale, who was on the opposite side when the skill merchant drew an ovation from all corners of a Waterford crowd with a superb 25-yard volley that is embedded in the memory bank of every spectator present. They ended up with Glenview and Andy Jnr tells a story about the team retreating to the pub after a game to find that Blackburn, a new force driven by Alan Shearer, were on TV. A trivia question was posed, asking if viewers could name the last Blackburn player to be crowned as the league's leading scorer. Sadly, he did not live to see Shearer emulate his feat. In May '94 aged just 55, he passed away after a short illness. Hale recalls a funeral that was in keeping with the man. "There was no PR thing about it. It was held in a small little church in Bray, with a very homely crowd and it represented exactly what Andy was. Modest, quiet, very honest. There was no emphasising the fact he was a great footballer." He was a great footballer, though, and half a century on from his finest hour, it's important that the tale of Andy McEvoy is preserved. Reproduced with the permission of Daniel McDonnell of the Irish Independent.